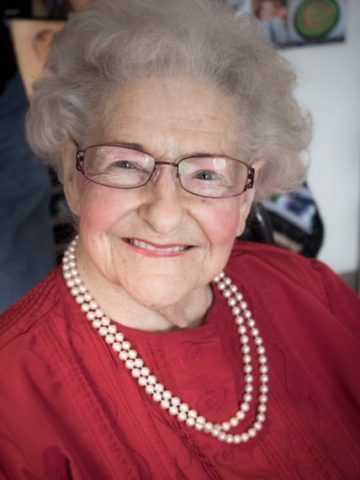 Mrs. Dixie D. Martin Varian, age 95 1/2, of Hendersonville, TN, crossed to her heavenly reward on Wednesday, April 18, 2018. “Miss Dixie” was born in Tylertown, MS, on October 27, 1922, the daughter of the late Carrol Martin and Delma Webb Martin. She grew up in Tylertown and was raised on a dairy farm. She met and married a Navy sailor, James Varian, in 1946. Enjoying a life together in the Navy for twenty years, they continued to bless others through the Christian Servicemen’s Center in Clarksville, TN, and later in Campers on Mission in their retirement years. As a Southern lady, she was a great cook and loved to garden and grow her own vegetables, especially butter beans. Dixie’s true gift was teaching small children about Jesus. She taught Sunday school to four- and five-year-olds for fifty years! Mrs. Varian loved her two children and her grandchildren with all her heart—moving close by so she could watch them grow up. In addition to her parents, Mrs. Varian was preceded in death by her husband of sixty-six years, James Varian; brothers, Willie Martin, Perdee Martin, and Wally Martin; and sisters, Edith Magee Behre Moore and Elizabeth Ann Martin. Survivors include a son, Nathan Varian; a daughter, Amanda Varian Sauer; her favorite son-in-law, Bob Sauer; three grandsons, Cory Sauer, Kendall Sauer, and Jamie Sauer; and two granddaughters, Victoria Sauer and Hope Varian. A Celebration of Life will be held Saturday, April 21, 2018, at 2:00 p.m., Hendersonville First Baptist Church (chapel). Interment will be held Tuesday, April 24, 2018, at 11:00 a.m., Middle TN Veterans Cemetery. Gathering of Family & Friends will be held Saturday from noon until the funeral hour at Hendersonville First Baptist Church. In lieu of flowers, the family respectfully requests memorial contributions may be made to Bible Broadcasting Network P.O. Box 7300 Charlotte, NC 28241 or Children’s Ministry at Hendersonville First Baptist Church 106 Bluegrass Commons Blvd Hendersonville, TN 37075. Jim and Juanita Kelly--The oldest niece to her. This very adorable aunt was just one of the best ever and truly she was loved by all who knew her, in fact, they just could not have been anyone better. We loved Dixie and Jimmy, and will always remember them as the wonderful, sweet friends we had while living in Hendersonville. We were neighbors and I remember Dixie always had her makeup on. God bless them both. Beautiful lady. So sorry for your loss. I feel you pain and my heart hurts for you and your family. Now your mom and dad can be together forever.